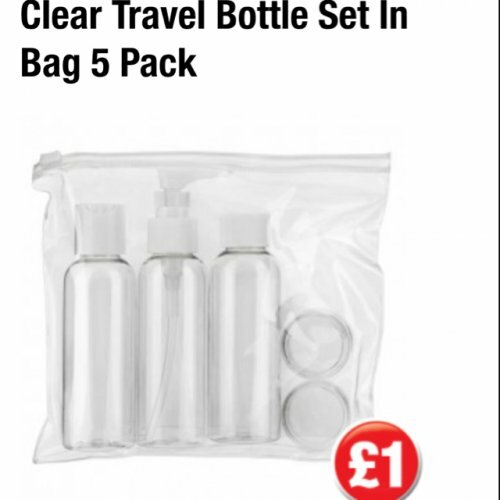 This pack of clear bottles holds less than the maximum amount allowed in luggage under today’s new stringent air travel regulations. They all fit into a transparent carry pouch, so they can be kept together to quickly and easily show to customs officials. The pack comes with the claim that it is ideal for carrying any liquids or creams that need to go into hand luggage. Mitchell was taking a business meeting in Paris and would be spending one night in a small hotel. He wanted to take his own products with him, and would only be carrying an overnight bag – so nothing would be going into the hold. 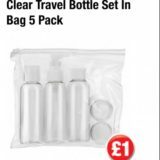 He took the pack home and set to work filling each little bottle with an appropriate cream and or liquid: shampoo, shower gel, moisturiser, after shave and so on. The set comes with three standard lids, and two different spray tops, one more like a perfume spray, the other offering a stronger squirt, rather like a cleaning spray. He found little use for either of the spray tops, and would have preferred the security of more standard tops. Aside from that, the set held his liquids safely, made it past security checks without trouble and allowed Mitchell to be clean and presentable for his meeting. Not really applicable, but the quantities are more than sufficient for a day or two, but probably not for longer than two days – other arrangements will have to be made! N/a.